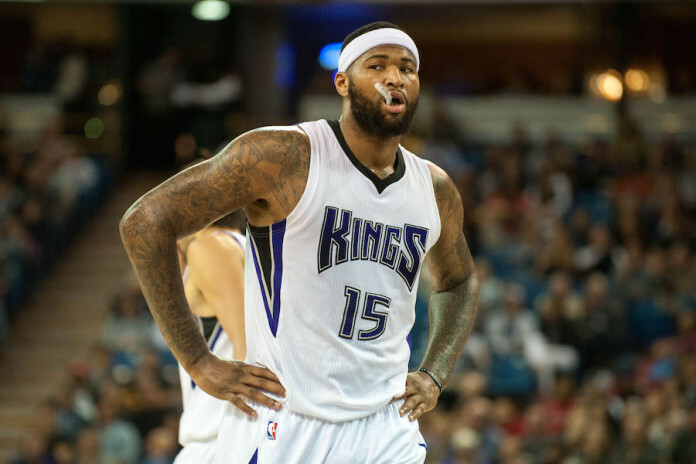 How well would DeMarcus Cousins fit in with the Denver Nuggets? With the Sacramento Kings looking to potentially trade DeMarcus Cousins, the NBA world has caught fire. Everyone with a twitter account is taking to the Internet to propose how his or her team will trade for the disgruntled, yet immensely talented, center. 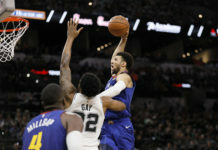 While the talk has centered mostly around the Los Angeles Lakers and Boston Celtics as landing spots for Cousins’ talents it may be the Mile High City that has the most to offer. 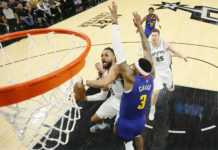 With three first-round draft picks and two second-round picks to package along with a plethora of young talent and savvy veterans on affordable contracts, the Denver Nuggets have everything they need to make a run at Cousins. With his connections to Michael Malone and fit with this young core that Tim Connelly has created, the chance at acquiring the enigmatic center may be higher then it so appears. *DISCLAIMER: I am moving forward assuming that if Cousins were to be acquired via trade that the deal would include Danilo Gallinari. Having said that I will be inserting Wilson Chandler as the game one starter at small forward. Lets round off the starting five with of Emmanuel Mudiay, Gary Harris, Wilson Chandler, Nikola Jokic, and DeMarcus Cousins. 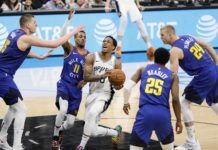 This group gives the Nuggets five playmakers on the floor at one time, which is the same approach that Golden State, San Antonio, Atlanta and Boston have taken to create their offenses. Adding Cousins and moving Jokic to power forward could be the key to a heavy ball movement/high efficiency offense that the NBA has been moving towards in recent years. Having two frontcourt players that can shoot, handle the ball, create looks for teammates, and have a low-post game is the first step towards offensive efficiency. Second step would be shooting. In this day and age of the NBA, shooting is an absolute necessity if contending for a title. Having two frontcourt players who can stretch out to the three-point line, coupled with the ability to have the offense flow through them from the high post, is a huge step toward that goal. For example: think of the difference between Kenneth Faried and Nikola Jokic standing 21 feet from the basket. No team is going to play Faried close. It allows the defense to sag into the lane, which led to Mudiay being suffocated on every attempt to enter the paint. If you put the 33 percent three-point shooting, pass-happy Nikola Jokic into the power forward position next to the offensive Swiss-Army knife that is DeMarcus Cousins, think of the spacing they could provide. It would alleviate pressure from the 20-year-old Emmanuel Mudiay to be the primary creator on the floor. It would also open up the paint, which in turn, provides more space on the perimeter for Mudiay’s shot. The spacing created when starting Cousins with Jokic would pay immediate dividends. Bringing in Cousins would not only help in terms of spacing, but in terms of creating mismatches in the pick and roll as well. No matter what pick-and-roll tandem you bring to the table, with this same hypothetical starting five, there would multiple problems it would create. Even having Cousins set a screen for Jokic on the perimeter. Do you go under the screen to keep Cousins from rolling hard and give that much space to Jokic and his silky smooth jump shot? Do you fight over the screen and give up the penetration to Jokic who can use his vision to kick out to shooters or drop in a floater over you? You also have to worry about Cousins rolling hard and obliterating anything in his path. There are very few frontcourt duos that could defend a pick-and-roll of that nature. Running the Mudiay/Jokic pick-and-roll would present substantially more issues with Cousins in the fold as well. Lets just say the Nuggets are playing the Thunder. Mudiay calls Jokic over to set the screen at the top of the key and rolls hard. Steven Adams would now have to worry about letting Cousins float out to the three-point line but is still tasked with protecting the rim. Having three other shooters on the floor would keep the Thunder from sagging, which leaves Adams having to choose between sliding out to the perimeter to cover Cousins or take on Mudiay/Jokic at the rim without help. These types of mismatches are the key to creating high efficiency shots. Now consider this: Michael Malone has preached “turning defense into offense” since he was hired as the head coach of the Nuggets. Sticking with the same starting five as stated above, all of those players are able to grab a defensive rebound and immediately take the ball up the court. This can stretch out a defense as well as discombobulate their set and send teams scrambling. Being able to push the ball with all five starters is one of the best ways to increase the pace and create mismatches in transition. If Malone is serious about wanting to use the elevation to his advantage then having as many players on the floor who can push the ball in transition will benefit the “run them off the floor” game plan that has been a staple of Denver Nuggets basketball for decades. Cousins has been labeled as a “coach killer” and potentially poisonous to a young locker room. These are some intense labels for a player to receive but they may be more franchise generated than a true reflection of Cousins. When Malone was the head coach of the Kings, he found a way to communicate with his somewhat unstable center. As their relationship grew, so did Cousins game. On the Pickaxe Podcast with Adam Mares and Greg Wissinger of SacTown Royalty, Wissinger had a great quote. For a player that has been labeled as “uninterested defensively” these numbers are quite solid. If Malone can get Cousins to buy in once again the Nuggets may just have a chance at building something special. DeMarcus Cousins stands as the best option in terms of fit and, even more important, a superstar that has a strong chance of staying in Denver for the long haul. If the Nuggets are truly ready to return to their playoff ways then adding DeMarcus Cousins is the first call they should be making. Lets see if the Nuggets front office has the courage to make it happen.